Well, the season’s almost done as we prepare for the summer season to end and for fall to begin, and Snow White of the Red Hair will be ending along with the season, at least for a little while until winter rolls around. This series has been a test of patience for me since while I love romance, the slow pace and episodic nature of much of the 2nd act made it a little bit of a challenge for me. I’m not very good with slice of life or slower stories unless something involved catches my attention. However, despite all of that, I have to say…it’s episode arcs like this one that make it all worth it . While these two episodes do have background story to them–something about a girl, her island people, and some cool birds, to be honest, that’s not really what this story was about. However, because I want to get into the meat of what this arc was REALLY about, let me all least give my impressions on the storyline just in case Kiharu isn’t just a one-off character and this storyline ends up rearing its head again. Well, what can I say, I liked it well enough. It wasn’t the most interesting of plotlines, but it did show another side to Clarines and a new culture that was slightly unique. I thought Popo was cute and his entire bird species was quite fascinating. 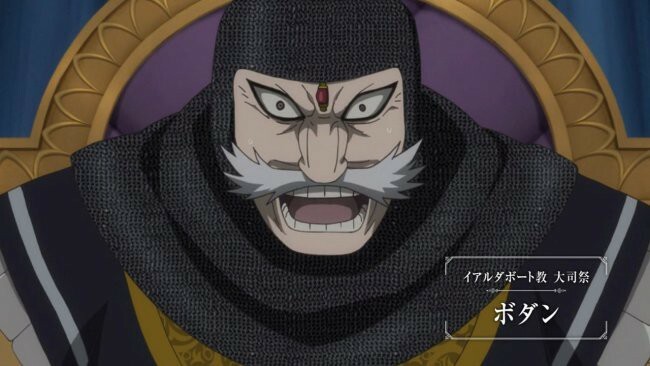 The story was a pretty black and white one, with the Islanders trying to fight for their birds and livelihood, against one of the most idiotic two-dimensional villains I’ve seen since Bodin from Arslan Senki. This duke just wants to be able to hunt said birds and selfishly entertain his friends, which is stupid enough. If the villagers are living and working on his land, I’m guessing they are something like serfs and thus they pay him for being able to live and make a living on his land with their income. Well idiot, if the people can’t make a living using the birds then you’re just losing important sources of revenue simply because you want to entertain a few friends. But no, he goes even further into idiocy! When the idea to turn the birds into messengers for the kingdom and thus make them a valuable resource and their habitat on the island a protected reserve for them, you actually want to not only go against this, but also sabotage the test that was done through royal edict? How dumb can you be?! Your land now has a valuable resource, do you know what kind of possibilities come from this?! Because of all that will have to go into this project and the laws and accordances that comes with it, you can get quite a bit of revenue from this. Also, there’s the possibility of contracts for these resources with non-government parties as well, which can lead to even more revenue and prestige. You turned an area that wouldn’t make very much for you, into a one of a kind place that can give whoever owns it more status and wealth than ever before. Why the heck would you go against this?! And on top of that, you go even further to try to sabotage a royal test, bribe and hold hostage an important friend to the prince, and then even try to threaten the soldiers. Now, you could potentially lose everything, and for what? A few hours shooting down birds with your no-good friends? Yeah that was intelligent. But of course everything works out in the end. The birds are saved and create a whole new revenue for the islanders. Kiharu (and her time-inappropriate hot pants) and her people get over their prejudice towards aristocrats and warm up to Zen. The duke is captured and Shirayuki, who was her usual heroine self and is a princess who is not okay with getting locked in a tower, is a-okay even after being injured once again. We’ve watching our leading lad and lady for 9 episodes now. I said back in episode 2 and 3 that Zen has already fallen head-over-heels in love with Shirayuki. He might not have realized it until a few episodes later, and even though he knows it now, that knowledge only makes things more complicated. But whenever he did realize it, he did figure out his feelings long before little Snow White even realized that there was an attraction there. This is clearly seen when Shira has been injured one time too many, and with a dangerous mix of concern, protectiveness, and the light hitting just right when she flashes him one of those oh-so-kissable smiles, Zen’s heart overtakes head and he just can’t take it anymore. The look on Shira’s face just says it all. She doesn’t reject the kiss, but she doesn’t respond either. She’s in complete shock right now. With a single action, she not only finds out that Zen feels more for her than she thought he did, but also that kiss changes the entire dynamic of their relationship. It has irrevocably closed the door on one chapter in their lives and unlocked another that they can venture to open if they dare to. Zen immediately recognizes his mistake and apologizes, but the damage has been done. Things have forever changed between the two and now that Zen has accidentally made his inclination known, he must wait to know what Shira’s feelings are on the subject. Well, she can’t really answer him since that kiss stole both her breath and her speech. It was such a cute, beautiful moment, and the perfect point to end the episode on. Neither she, nor the audience were expecting it and now that it’s inescapably moved their relationship to the next level, there are new questions, new problems and no clear answers yet. I wonder why, I didn’t see it there before. Episode 11 is as saccharine and sweet as us romance fans like it. It’s not overly cheesy, and neither is it too vague and stalwart. Shirayuki’s is trying to sort out her feelings, this being her first real experience with love. They do a great job showing all the signs from awkward moments, blushes, heartbeats racing, and the overall uncertainty of what’s even going on anymore. Ever since they met, Zen has been a source for inspiration and strength. Together the two have been through some interesting times as they taught each other how to be able to lean on each other’s strength. They’ve begun to cover each other with a love that was there, just waiting to be revealed. While Zen’s physical attraction was immediate and his attraction to her spirit and her soul took a little longer, for Shirayuki it was the opposite. For her he was a dear friend that she could count on and draw strength from and give it back in return, unknowingly falling in love with his kind and valiant heart. She probably did recognize him as being handsome too, but it never really connected until now. And now with a single kiss, the sleeping bud has begun to bloom and she has now has all the signs. You begin to get weak in the knees. Your head’s in a whirl. And then you feel light as a feather; and before you know it, you’re walking on air. And then you know what? You’re knocked for a loop, and you completely lose your head! Yes indeed…Snow White has become–twitterpated. New, and a bit alarming, who’d have ever thought that this could be? We watch Shira stumble around through the throngs of first love, while Zen (who’s a little more acclimated to the situation) plays the waiting game behind his staunch facade. And while these two are struggling with their feelings, much of the comedy comes from our eternal observers Kiki, Mitsuhide, and Obi as they know something is different between the master and his lady. But of those three, Obi is probably the one that we will all have to keep an eye on. It’s somehow been both subtle and yet quite obvious that Obi has begun to develop feelings for our red-headed heroine. It makes sense and both you and he know that it won’t go anywhere, but you do sympathize with him and I’ll be interested to see where this subplot leads to. And of course we get to the final scene in the forest where a chorus of birds sing and the sun shines upon our couple as they finally admit their love for each other and take this relationship from the close friendship it was, to something else much deeper. Seeing Shirayuki tearfully admit to realizing her love for Zen was a beautiful scene, especially since you know how much she has agonizing over trying to search out her feelings for what exactly her heart says about Zen. And in the end, when she finally says it aloud, her heart guiding her, and it’s no longer complicated and everything that needs to be said is said. Her admission is resplendent, just as much as Zen’s heartfelt admission that while he doesn’t know what will happen and if all he has will be able to protect her, he will give all that has to her, and then gives one of the most beautiful and yet roundabout proposals to be seen in awhile. And so now, promises and vows were made, and our finally fully formed couple have moved from one stage to the next, and while there are sure to be challenges in the future, for right now, we can only bask in their sublime joy and be just as happy for them as they are in this contented moment. I’m really happy that this series didn’t decide to wait even longer for this moment that we all knew was going to come eventually, but they did a very good job with it. There is one more episode left before the season end, but really, it can only serve as an epilogue after this last arc. One where will be saying goodbye to Zen, Shirayuki, and the kingdom of Clarines until Winter 2016. And this was an excellent point to end on before we must take a break. Next season we can go into the challenges our couple are bound to run into. Of course there’s the fact that Zen is a prince and Shirayuki is a foreign commoner. Their friendship was seen as eccentric but considering Zen’s nature, not unexpected. However, their engagement is something else entirely. This will not go over well in Zen’s circles, and while Shirayuki has supported Zen all this time, becoming the wife of a prince is not something she’s completely prepared for yet. However, I will be looking forward to how the two end up overcoming all the obstacles in their way. I think their love is strong enough to withstand the opposition, but we’ll just have to see. Snow White and Rose Red. Kissing. Genderbent. Yeah, I was kinda crushed by the absurd villainy in episode ten. It was a great opportunity to world build; a new place and they could underscore the social structure had they toned that idiot down to just “competitive levels”. So many ways to work that without resorting to Villain/Idiot Ball and Load Bearing Villain tropes. But, I enjoyed how they stretched the story out concerning the love interests. It’s the sort of romance that needs to be a little less “storybook” and a bit more practical. Romance is fine and all, but it is not the sum total of a working relationship. So, I respect the story having both Zen and Shirayuki working things out as dedicated partners first. They get to see the ins and outs of how this relationship is supposed to work, by seeing the same in each other. They both want to be better people for each other and to each other. That’s a good romance right there. I can be a little bit understanding of the Viscount’s attempts to sabotage the test. Nobody wants the government to declare their land protected, because it takes away from what you want to do with it. There’s a reason the “Three S” method of dealing with endangered species exists. Not that it’s right, but there’s incentive. I hope you’re not calling this a ‘slice of life’ show. If this is, then everything is (which is technically correct, but not germane to the conversation). Shirayuki will still have her work cut out for her, but she’s proven to everyone that matters (mainly the retainers for Zen and Izana as well) that she wasn’t in the castle just to get close to Zen. I think she’s won over everyone else and their relationship is gonna be full steam ahead. I guess it isn’t really slice of life, but that’s how it sometimes feels to me. I don’t take back anything I said about that silly aristo, they really just needed a short, simple background story that could frame the Zen/Shira romance, and a very simple villain to bring conflict to that background story. Shirayuki has planted herself in everyone’s hearts so that she won’t have to prove herself to them, but there will be a challenge coming ahead, especially for Zen’s class circle. Also, are we ever going to see Zen’s parents? They are still alive right? I forget whether they mentioned it, but I assumed so since Izana hasn’t take the throne yet. I wonder how Shira is going to get along with them? Also, where do you think they might take Obi’s affections for Shirayuki? I can think of a few plotlines where they may take it, but I don’t what there to be a triangle either. Do you think they’ll introduce a someone for him. I’ve already heard that Kiki and Mitsuhide might have a future romance so I want someone for Obi. He’s such a nice character, I don’t want him stuck as the unrequited love interest. Also, are we ever going to see Zen’s parents? They are still alive right? Zen and Izana’s parents are mentioned in later volumes, from what I’ve heard manga readers say. Their father, the King, passed away when the princes were young. Their mother, the Queen, overworked herself trying to manage Clarines and had to be sent away to recuperate in the countryside. (The Queen appears in later chapters. )This left Izana as Prince-Regent to rule in his mother’s place. If he’s responsible enough to rule, why don’t they just coronate him already? I understand about laws and traditions, maybe that’s it, but really, he looks to be of age already. But then, how is he old enough to serve as a regent, but not old enough to take the throne? And since he is heir to the throne, wouldn’t the queen be the regent in his stead until he comes of age? So…he’s basically serving as the regent of someone already serving as a regent? Though it would be interesting if through fate, Zen ended up becoming heir apparent. I don’t know if he could handle it though. Then again, it would be an interesting situation since he would have to get ready for a position and responsibility he never even considered. And since Izana is heir to the throne, wouldn’t the queen be the regent in his stead until he comes of age? The manga barely goes into details, but it says Izana helped out the Queen a lot during her reign. She grew confident in Izana’s skills, and ended up passing the Regency to him much earlier, while she retired to Northern Wistalia. Izana is crowned King in a later arc; that’s where the mother appears. She still hasn’t met Snow White yet. Fair warning, the manga’s also quite slow-paced and leisurely. That still makes no sense to me. At first I was thinking that maybe the royal line went through the queen rather than the king, and so that would make sense that he would be prince-regent and stay that way until she returned and then he would be back to being heir apparent until her death. However, it makes no sense to pass the regency onto the person who is supposed to be the heir in the first place. If she could no longer handle her position and Izana still wasn’t of age, than the regency should have been passed on to another person who would take care of the kingdom until either the queen returned or Izana was old enough to take the throne. In this case he should have been crowned king already, it just feels contrived that he’s still first prince at this point. Hopefully they do explain that more. I actually might be able to handle the manga better since I handle reading a little bit differently and slow romances are a different creature for me when I read them versus when I watch them. I don’t know why, but that’s just how it is. Basically, it can be taken as a given that the Zen will never be in charge, therefore he just has to not embarrass the royal family. There is room in the future of the story for them to, say, kill off Izana, and have there be progress at some later date as Zen takes over the throne, but at this point in the story, it’s just pure distraction to think about it (like that stupid “3rd gender” in Sidonia was: Something people spent way too much time thinking about that was ultimately not used at all in the first series, and then completely ruined in the second series). Things like that bug me to distraction, but I can’t help it. Especially since the show is so laid back. Those things that don’t make sense logically then jar me out out of it and my mind gets wound around it. It’s something that I must make sense of in my own mind. And honestly, I do like Zen, but even though he’s the male lead, he’s not the most interesting male either. Taking zztop’s advice, I’ve started reading the manga (which thankfully gets more adventure later on) and I’ve found myself liking Obi way more than Zen. I still like Zen, but characters like Obi and Izana are just way more compelling. Sometimes it almost feels like Zen is being tossed around between them. Both Izana and Obi like to test Zen, and he reacts and changes based on these challenges. Unfortunately, if they continue to follow the manga, Obi is going to be a third wheel for quite some time, which kind of disappoints me since I know it will never happen. I’ll just have to keep reading and hope they will introduce a girl for him soon. As for Zen becoming king? Of course that would be later. I don’t expect anything like that right now, I mean quite a ways down the line, perhaps even after Izana becomes king. There wouldn’t be any other heir until he had children, and Zen would become complacent in his role after Izana is coronated. However, when someone becomes complacent, it’s the prefect time to shake things up. Where are they gonna take Obi’s feelings? To the friendzone. He can fall in love with anyone else he wants. But you don’t make a move on your boss’s girl, and you don’t make a move on the prince’s girl. And if they’re the same girl, then you just don’t even think it. And who by the way is a nice person but they’d have to do some real gymnastics to get her to be looking at Obi in that way. It’s not like he has some qualities that would appeal to her that Zen doesn’t have. Zen’s got enough ‘bad boy’ or roguish charm in him that there’s no gap there, and Obi doesn’t really have anything else. I also don’t think there’s a worry about Zen’s parents, unless they’re terrible characters. I mean, it would be pretty obviously inauthentic for Zen and Izana’s parents to be crappy people, and we’ve seen Shirayuki win over even kinda crappy people. So unless there’s a proliferation of the idiot ball, I can’t imagine a problem there. In terms of Obi, I doubt he will make any kind of moves either, he seems to be happy for the couple. I just want a girl for him too. The only way I could see him doing anything is if something happens like a threat that Zen can’t handle comes to Shira because of his relationship to her, or there is some kind of forced betrothal ultimatum or something, and they do that cliche of him purposefully hurting her in order to protect her. In that case, I could see Obi threatening to take her from him, in order to get him to come to his senses. Obi honestly seems to be more loyal to her than to Zen, and I could see him leaving if Zen ever did anything monumentally stupid. As for his parents, it wouldn’t be that unusual for the parents to be crappy and the sons not, especially for royalty. I mean, Arslan in my other series is the most recent example of that. But like you said, I don’t think they’ll do that, though it would be interesting circumstances. (The succession rules) still makes no sense to me…Hopefully they do explain that more. Try read up the manga, see how it compares to the anime. For a fantasy, Akagami’s pretty humanistic and down-to-earth. It doesn’t use typical fantasy elements such as magic, elves, demihumans, dragons, demon kings etc., and the most OP ability so far is Obi’s semi-ninja agility. But I think with them now moving from the friendship stage to actually being a couple, I might get more into it. I don’t really need a bunch of fantasy elements or anything, just make the relationship and the characters interesting and I can get into it. I do have a love for drama though that sometimes makes me impatient when there’s a lack of it, but we’ll just see how they rest of the series goes. I think it’s hit its stride and I’m enjoying what I see. If she sticks around, and she easily could because of the bird messengers, I’d nominate Kiharu as Obi’s love interest. From what little we’ve seen of her personality I think they’d go well together. For the sake of their romance I hope Zen doesn’t end up king. As the younger prince he could just marry a commoner. There’d be talk and opposition, but it could be accepted as him being eccentric, because it wouldn’t matter that much. But the king would have to marry for a political alliance that would strengthen the kingdom. It would take an awful lot for Zen to end up as king. He’s been the 2nd prince the whole time, Izana is far more suited to be a king, and completely acts like he is going to be the king. Maybe Izana will fall for a foreign commoner and abdicate, but then we’re back to the idiot ball. I didn’t really see much contact between them together, much less any kind of chemistry, so I’m not sure about Kiharu. It’s a shame that guy from the disgraced family way back in the beginning that kidnapped Shirayuki wasn’t a girl. Or maybe he has a sister that has yet to be introduced? When I saw him, I always thought that he had potential to return, so that might be interesting if he brings some other associates along. I don’t know, I think him having to be king would be an interesting challenge to his character and how he would rise to such a responsibility. I don’t want Izana to go anywhere, I like him a lot, but I also still think the situation would be interesting. And let’s not forget that despite what’s been seen so far, this story did start off on the backbone of a fairy tale, and how many crown princes marry commoner girls in fairy tales? So, that’s not that strange either. I don’t remember Kiharu and Obi really interacting at all. However, if she comes to stay at the palace as a handler of the messenger birds (and that would make sense) then they would have the opportunity to interact. And from what we saw of her personality I think the two of them would be a good fit. If Obi is starting to have feelings for Shirayuki, he’s liable to find another independent spirited young woman attractive. I don’t know, her just being independent isn’t enough. If so, he would have fallen for Kiki, who’s like the most independent girl in the show. And I’m not even sure if Shira’s type is right either. Yes, he likes her, but I’m wondering where those feeling came from. It almost seems more like an affection that grew simply from constant contact more so that a love that will last. I don’t really see much chemistry there either. As for Kiharu, we’ll have to see, but she just seems like too clean cut a girl. Honestly, when I picture a girl for him, it would probably something closer to Alfreed from Arslan, just slightly older. I don’t know why, but I see him with a girl with a rougher background but a kind and caring personality. We really haven’t seen enough of Kiharu to judge her personality fully. However, her traveling alone to the palace to protest the killing of the birds indicates she’s not the retiring type. She could very well be more than a bit of a tomboy. And she’s certainly kind and caring when it comes to the birds–I think she’s genuinely committed to their well-being and not just because of their value to her island’s livelihood. I think Kiki is out. When a potential romance between her and Mitsuhide was mentioned in the comments of an earlier episode someone (don’t remember who) said that later on in the manga that did happen. You yourself mentioned that in a comment above. But I just threw in Kiharu as a potential romance for Obi because you wondered if there’d be someone for him. So I speculated that she could be that one.